For centuries the saints who wander the depth and breadth of India have made it their custom to stay in one place throughout the rainy season. During this period, which lasts about four months, they intensify their own practices, organize group practices, and sometimes offer an in-depth study—open to the public—of a scripture or a particular aspect of spiritual practice. This special period is known as chatur masa or chatur masyam. It begins on the day of the full moon in the month of ashadha, which corresponds roughly to the month of July in the Western calendar. This day is called guru purnima and is dedicated to the guru lineage. Many Western spiritual centers celebrate guru purnima at the full moon in July. The following address, given by Sri Swami Rama, reminds us of the true meaning of this special day. In all spiritual traditions this day is considered to be very holy. For on this day students become aware that life is not to be lived only in the external world—that there is something higher, deeper, than what they have been doing. They become aware of their internal states. But to find this something you need a guide. Then it becomes easy. Your guide shares his experiences, which have been imparted by his guide. There is a long chain of sages and traditions, and they impart knowledge to their students lovingly and selflessly. For me, today is a great day. When this day comes I remember the way I was looked after by my master. He was so loving. When I see darkness everywhere, in all relationships in the world, from one corner gleams light. I call it the light of the guru. If you find a real guru, he can give you his help. He can sacrifice his whole life for you if that time comes. He will pray for you. He never wants his students to suffer. When you have a burning desire to attain enlightenment, definitely you get guidance. But remember that suffering comes from within, and if you cry for help, you are helped. Many times help comes from the invisible world, and you don’t see it. Yet you get help when no one can help you and you say, “God help me!” If you have a guru or teacher, and he is very sincere, and if he is in touch with the tradition, then anyone from that tradition can appear and help, provided you are on the path. 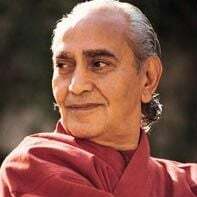 It is said, “When you are ready, the guru appears”; it is never said, “If you are not ready, the guru appears.” When you have a burning desire to attain enlightenment, definitely you get guidance. You are never lonely on the path of spirituality. That which makes you lonely is the world and its external relationships. On the path of spirituality you are all alone, which means all-in-one, but you are not lonely. And as you attain the heights a time comes when you are totally alone—because all peaks are lonely. But that is not the sort of loneliness you find in the world. This loneliness is fulfilling. You don’t feel alone. You feel one with the Absolute Reality. You can do this. Not by worrying, not by taxing your mind, not by physical exercises, but just by purifying your heart and mind. The easiest and surest way is that of self-surrender. You don’t surrender yourself to any external force. No. You surrender your ego to the Atman within you. And then a fount of knowledge flows. Then you come in touch with that happiness which is self-existent and unending, from eternity to eternity. So this day reminds students that mere living in the external world is not fulfilling. The purpose of living should also be attained. You have to do certain duties—that’s a must. But all duties should lead you to the awareness, “God exists in me. I am a shrine of the Lord. Why am I afraid? From where does this fear come?” If you remember that you are a shrine of the Lord, you will never be afraid. When you get fears, it means you have forgotten. God provides, providing you have that confidence. You develop that confidence slowly. But remember—God is merciful, but at the same time he is a cruel fire. You have to understand both aspects. You have to accept life as it is, and enjoy. Don’t postpone enjoyments for tomorrow. Enjoy today—right now! Smile. Smile and understand, “The Lord is within me. Why am I worrying?” This way, make your life easy. This day reminds us that we have come to this earth to become complete, to attain perfection. And you can do it. Use all your might, all human effort. This is called the ascending force. Then you come in touch with the descending force, which is the grace of God. The moment you have done your work, you’ll find grace. So do your job skillfully. Surrender all the fruits to Him. Before going to bed, say, “O Lord, anything good I have done, I surrender to you. Help me, guide me.” This way awareness develops. You become constantly aware of the Reality within you. So today is a day when I, when everyone, remembers his teacher, his teachings, and becomes aware of the Reality within. This day makes you aware that you have to tread the path faithfully, loyally, and honestly so that you complete your journey happily. It is called guru purnima day.